The modern Planet of the Apes films are textbook examples of how to build a franchise. Rise of the Planet of the Apes was a solid new beginning for a series that seemed dead in the water. It was by no means perfect, but it laid the groundwork for some interesting ideas. Those ideas were further explored in Dawn of the Planet of the Apes, which took the action, character development, and drama to another level. Now we get War for the Planet of the Apes, a follow-up that’s somehow even better. Like The Lord of Rings and Captain America, this is a rare trilogy that only improved with every passing entry, demonstrating that blockbusters can make audiences think. As the title suggests, a world war has escalated in this third installment, but it’s not just ape vs. man. 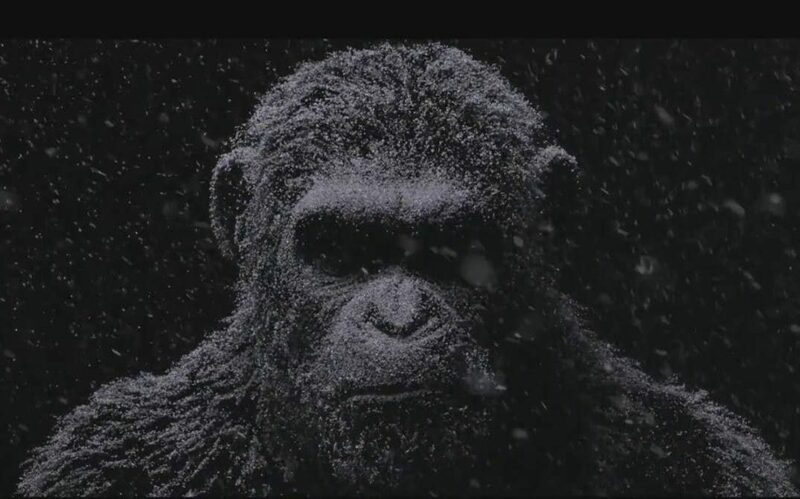 Some apes begin to doubt their leader Caesar, once again brilliantly portrayed by the great Andy Serkis. They thus decide to team up with the bloodthirsty Colonel, played by Woody Harrelson in one of his most haunting performances. Of course not every human agrees with the Colonel’s questionable methods, meaning it’s also man vs. man out on the battlefield. In the same vein as Wonder Woman, this film provides a surprisingly intricate depiction of war, exemplifying how it’s not as black and white as some think. There are even echoes of the holocaust that draw comparison to the slavery metaphor from the Charlton Heston version. After the Colonel hits the apes where it hurts, Caesar decides to track him down and get his revenge. Caesar isn’t alone, as longtime companions Maurice (Karin Konoval) and Rocket (Terry Notary) are along for the ride as well. Down the road, they come across an emotionally and physically scarred chimpanzee named Bad Ape, played a particularly effective Steve Zahn. They also take in a mute girl named Nova (Amiah Miller), who’s kind of like Newt from Aliens. The apes have always been the most intriguing characters in this franchise while the humans have been kind of hit-and-miss. War for the Planet of the Apes wisely keeps the focus on the CGI characters, something that the Transformers movies should’ve started doing a long time ago. The result is one of the most ambitious summer movies of recent years, calling something like Jim Henson’s The Dark Crystal to mind. Since most of the apes can only communicate through sign and body language, much of the film plays out like a silent picture. Well, a silent picture with shootouts and explosions that is. While the action here is mostly phenomenal, it’s not just nonstop chaos. Director Matt Reeves also takes the time for a lot of subtle, atmospheric moments, creating genuine tension, depth, and pathos. There are even a few scenes where you might just get a little choked up. All the while, the film showcases the most emotive and convincing motion capture effects the franchise has ever seen. In an age where so many action movies bombard us with exposition, this is visual storytelling at its finest. Since the film is largely about the evolution of apes, it’s especially fitting that they take center stage as the humans are devolved. With that said, the humans that are given the spotlight do shine quite bright. As mentioned before, Harrelson’s performance will chill you to the core, dominating the screen with the presence of a Shakespearean villain. Young Amiah Miller gets a good deal of emotion across without much dialog, which is made all the more impressive when you consider the fact that she’s acting opposite people in performance-capture suits. War for the Planet of the Apes knows exactly how much to deliver in virtually every department, although the climax arguably could’ve been a bit grander. While the climax is by no means bad, the final battle feels relatively small and short for a movie called War for the Planet of the Apes. Maybe it’s because the rest of the movie set the bar so high, but this is the one area where the filmmakers left me wanting more. Nevertheless, the final act is still stunning, powerful, and occasionally epic, leaving us on a bittersweet final note. It’d actually be appropriate if this were the last we see of the Planet of the Apes. Of course if the filmmakers can keep up the momentum going forward, I’d have no problem watching several more sequels. Whatever lies ahead, this trilogy stands out as a cinematic achievement well worthy of the 1968 classic. This entry was posted in Reviews and tagged Action, Adventure, Drama on June 26, 2017 by Nick Spake.